However you feel about the details of Patriots Day, chances are you will leave the theater in a state of high tension. Writer/director Peter Berg, with co-writer Matt Cook and producer/actor Mark Wahlberg have resisted the temptation to spend excessive footage on personal stories. 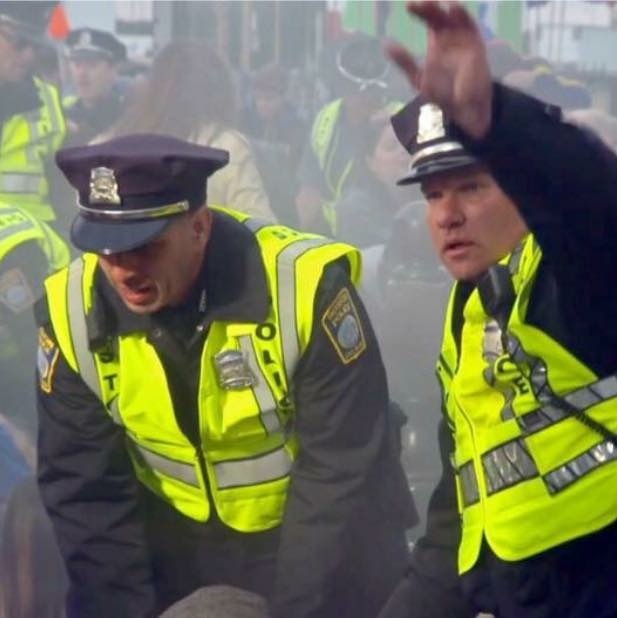 This gives us two wrenching hours of unrelenting violence that deliver the reality of what racers and spectators must have experienced during the Boston marathon bombing on April 15, 2013. The good side of that is that we are fed the truth of the tragedy without fictional additives; the tough side is imagining its effect on the people of Boston. Let’s take a look at that. Three died and 264 were wounded on that day just four years ago. Is it too soon to fictionalize the tragedy that hurt so many? What about the resentment at Hollywood profiting from their pain? What about the thousands of innocent Muslim American citizens buffeted again by the actions of two? Then there is the ease with which two young terrorists destroyed so many and so much in just a few minutes. Will that be contagious? The truth of it is that the movie is so accurate, so well made, and so authentic that these questions fade next to the importance of showing the public the awful cost of a terrorist act. On a bright April day, hundreds of runners and thousands of spectators jammed the streets and sidewalks of Boston for the race so many have enjoyed for so long. On that festive day the lives of many were shattered when the brothers Tamerian (Themo Melikidze) and Dzhokhar (Alex Wolff) Tsarnaev carried homemade bombs in their backpacks and planted them to explode twelve minutes apart. Next stop was to be Times Square. With a fine cast (Kevin Bacon, John Goodman, Michelle Monaghan, Mark Wahlberg, and J.K. Simmons – among many others), the movie shows us the explosions, the injuries, the deaths, and the shock. After some initial resentment, the Boston police and the FBI work together in the search for the brothers. That search is punctured by more violence after the brothers are identified on film. The search is riveting. Patriots Day is a harsh warning that our country is no longer immune to terrorism. This movie serves as the salute Boston deserves for the way they handled that day. This review was posted on January 21, 2017, in Drama, History/Biography, Thriller. Bookmark the permalink.